A place to meet friends… an oasis for the weary… a people-watching vantage point… a romantic hideaway… even a mobile office. For almost a century, cafés have fulfilled an important role in New Zealand society, constantly evolving with the times. The decades may have passed, but the café's place in everyday life has rarely wavered - perhaps because its form and function have always changed to reflect the society of the day. The so-called 'café culture' is literally a moving feast, from the comparatively quaint tea rooms of the early 20th century to the coffee-literate, Internet-connected counterparts we know today. 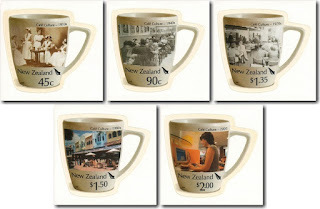 The stamps, produced in the shape of a coffee cup, were supplied as a strip of five stamps, comprising one stamp of each denomination, as well as sheets of 25. 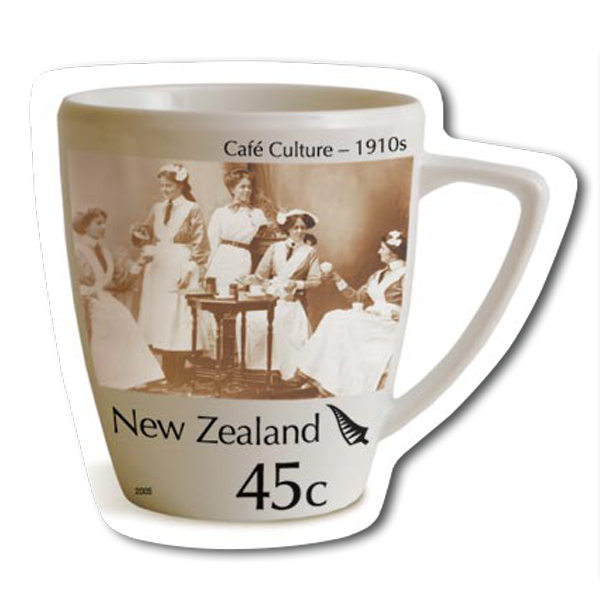 The café culture first appeared in New Zealand during the early 20th century, as the arriving European immigrants introduced eating establishments with names such as 'coffee shop', 'cafeteria', 'lounge' and 'tea rooms'. Advertisements around the 1920s promoted 'clean' premises and 'dainty' sandwiches and cakes, with speciality suppers selling for just one shilling and sixpence. 90c - 1930s - 1960s / Milk Bars and Coffee Bars (Self Adhesive). From the mid-1930s American-style 'milk bars' began to appear. With a different, less formal layout than restaurants, they became popular meeting places for young people. Then in the 1950s, 'coffee bars' became the place to go, perhaps because as well as being open during the day, they stayed open for much of the night. 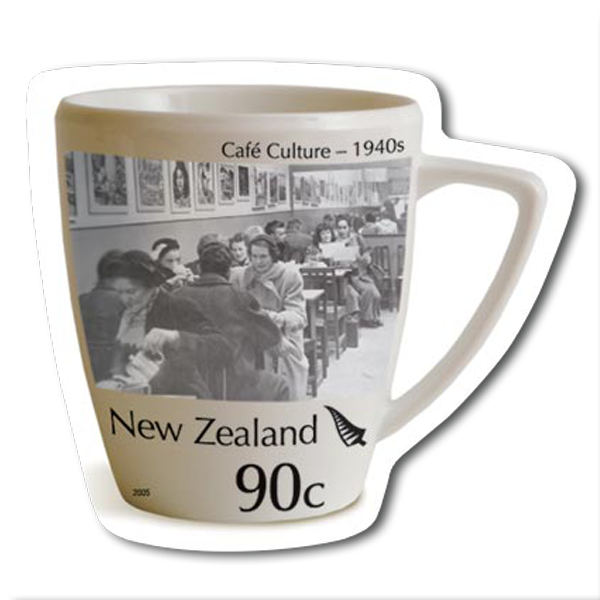 With their dim lighting, sparse furniture and Cona-style coffee, they dominated New Zealand's café culture for the next 20 years. $1.35 - 1970s - 1980s / Café Delicatessens (Self Adhesive). With the dawn of the 1970s, coffee shops, bars and lounges began to disappear as people stayed home to watch the relatively new invention of television, hotels offered later opening hours and restaurants provided more sophisticated cuisine. Deli/Cafés took the place of coffee shops, providing sit-down and takeaway service with special breads, salads and espresso coffee. The next wave of café culture had begun. $1.50 - 1990s / Licensed Cafés (Self Adhesive). By the 1990s, New Zealand's café culture was experiencing a renaissance after the doldrums of the 1970s to the late-1980s. Cafés offered a wide range of coffee options - from espressos to lattes and everything in between, with coffee beans sourced from all over the world - as well as food and sometimes alcohol. They were open for breakfast, lunch and dinner, offered live music to dine to, and took their business and their tables outside. $2.00 - 2005 / Internet Cafés (Self Adhesive). In 2005, the café culture is alive and thriving in New Zealand. More than social venues, cafés have become corporate meeting rooms and offices, with 'wireless' connections turning downtime into uptime for business people and their laptop computers. Coffee-making has even become competitive, with baristas vying to make the perfect cup of coffee - and coffee drinkers are in turn becoming coffee connoisseurs. First Day Cover - 4 May 2005. 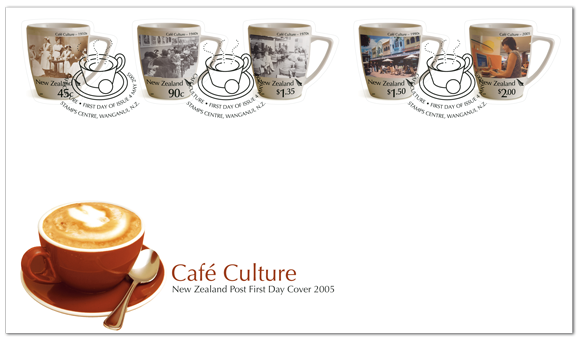 The Café Culture first day cover featured the quintet of classic coffee mugs with the perfect accompaniment - a frothy concoction that will appeal to anyone captured by the caffeine craze. Date of issue: 4 May 2005. Denominations and designs: 45c Café Culture 1910s, 90c Café Culture 1940s, $1.35 Café Culture 1970s, $1.50 Café Culture 1990s, $2.00 Café Culture 2005. Stamps and first-day cover designed by: Stamps Business, New Zealand Post, Wellington. Printer and process: Wyatt & Wilson, Christchurch. Stamp size and format: 31.2mm x 35mm (vertical). Paper type: JAC stamp grade self-adhesive stamp paper. Special blocks: Plate/imprint blocks could be obtained by purchasing at least six stamps from a sheet. Barcode blocks, value blocks and logo blocks could be obtained by purchasing at least two stamps from a sheet. Barcode blocks were available in both A and B format. Period of sale: These stamps remained on sale 3 May 2006.